Man binding his hair (Diadoumenos). This statue is a good example of the classical Greek pose of contrapposto where one leg bears the weight of the body while the other leg is in a resting position. This weight distribution forces one part of the pelvis to be more elevated, creating thus the spine to aquire an S curve shape in order to make the body balanced. 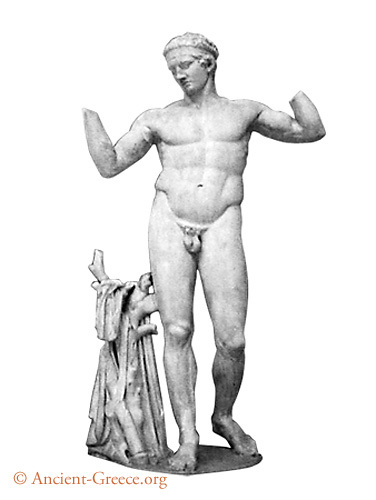 The original statue was carved by Polykletos around 420 BCE. This one is a Roman copy from around 100 BCE. Diadoumenos was a favorite subject and many copies exist in various museums. Height: 1.95 m. National Archaeological Museum, Athens, Greece.